Join us for a special Toxics and Treasures tour on Saturday, October 20th, from 1:00-3:00 PM. 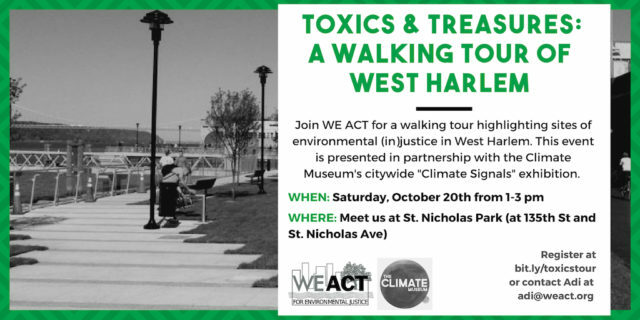 This environmental justice walking tour of West Harlem is free of charge and will inform attendees about the neighborhood’s struggle for environmental justice by visiting a number of key sites. The tour will begin and end at the St. Nicholas Park site of Climate Signals on 135th St., where we’ll discuss the Climate Museum’s citywide exhibition drawing attention to climate change and how you can join the movement.